We build sites for every device. Web design has changed. Where once you could presume users accessed sites on desktops or laptops, now they could be using any number of devices. That means websites need to be built differently and that takes a different approach to your web design. But, whatever the site and whatever the device, the same set of expertise is required. That is where we can assist. Some agencies specialize in “front-end” development, others “back-end”. We’re experts in both. 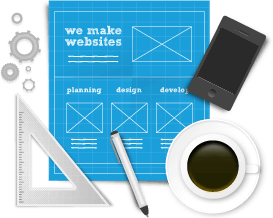 We create beautifully crafted HTML and CSS but we can also integrate it with business systems. Although we use technologies such as HTML5 and CSS3, we still ensure your website will work in older browsers too. We can even create user interfaces that adapt to small screen devices such as mobile, using techniques such as responsive design. We believe in providing an acceptable experience for all users. In other words, the sites we create are built to work in pretty much any browser or device. This, of course, doesn’t mean that your site will look identical in every browser. Older browsers simply can’t offer the same experience as more modern browsers so there will be aesthetic differences in presentation between, say, IE8 and Firefox. The launch of your website is the beginning not the end of your project. To sustain and improve its value to your business, we'll work with you to update and enhance your website as required. This is also why we include an unequaled, twelve month warranty on all of our new projects. We want to be your IT partner. We will train you and your staff to make updates yourself - but we are never more than a phone call away. You do the easy things, we can handle the hard things -- so you don't stress out. If you happen to have a website that we didn't build, we can help you maintain that as well!